5.1. Why are the Area() and ShowName() methods are declared abstract in the Figure class? 5.2. Why Figure class is declared as abstract? 5.3. Why in the class Figure methods Area() and ShowName() do not contain the implementation code (method body)? 5.4. Is it possible to add other non-abstract methods in the abstract Figure class? 5.5. Is it possible to create an instance of the Figure class in the main() function of the UseAbstractClass class? 5.6. What is the essence of late binding in the GetArea() method of the class UseAbstractClass? 6. Is it possible to declare in an abstract class some non-abstract methods, that have a (body) implementation? 8. Can an abstract class does not contain abstract methods? 9. What are the differences between using abstract classes and using interfaces? An abstract class is a class that contains methods that have no implementation. An abstract class is created to create a common interface between different implementations of classes that are derived from an abstract class. An abstract class is created to define some common features of its derived classes. It is forbidden (it makes no sense) to create an object of an abstract class. A class is considered abstract if at least one abstract method is declared in the class. Before declaring an abstract class, the abstract keyword is placed. parameters1, parameters2, parametersN – the list of parameters that receive the corresponding abstract methods with the names AbstractMethod1, AbstractMethod2, AbstractMethodN. Abstract method – a method whose implementation in the program does not make any sense. The abstract method is only a declaration of a form (interface) and not an implementation. As with the abstract class, the abstract method starts from the abstract keyword. If an abstract method is declared in a class, then the class is also considered abstract. In this case, the abstract keyword is also placed before the class name. If a certain class is inherited from an abstract class, then this class must override all abstract methods of the base abstract class. Otherwise, an error will be generated. AbstractMethod – the name of an abstract method that returns a value of specified type and receives parameters. In the class inheritance hierarchy (extensions), abstract methods are something common. Specific implementations of abstract methods are placed on classes inherited from abstract classes. 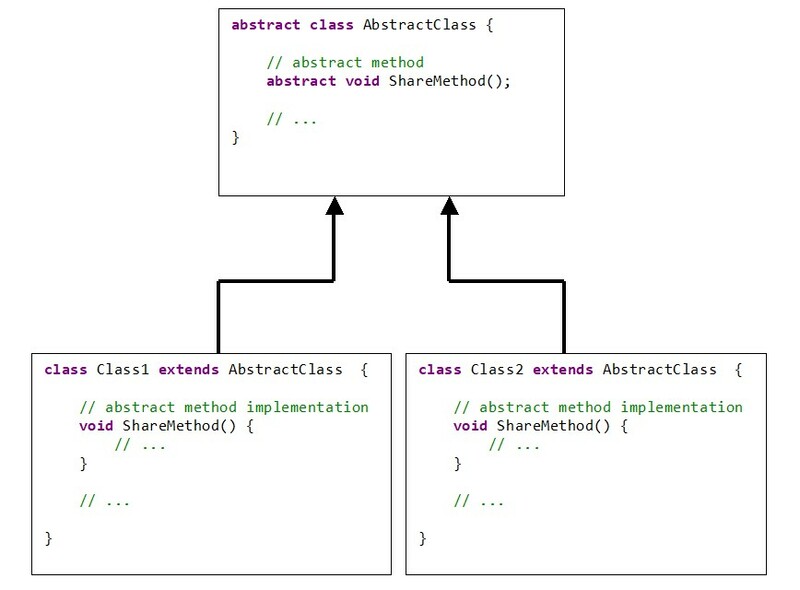 The diagram shows a simple example of declaring an abstract class called AbstractClass. This class contains an abstract method declaration named ShareMethod(). From the abstract class AbstractClass two classes are inherited with the names Class1, Class2. These classes implement the ShareMethod() method, which is declared in the AbstractClass class as abstract. The example declares an abstract class Figure, describing general information about a certain geometric figure on a plane. From the class Figure two classes are inherited (Triangle and Circle), which override the abstract methods of the class Figure. method that returns the name of the figure (the value of the name field). Two classes with the names of Triangle and Circle also implemented. These classes inherit (extend) the class Figure. the Area() method, which overrides the abstract Area() method from the Figure class. The method calculates the area of a triangle. the method ShowName(), which overrides the abstract method of the same name of the class Figure. The method displays the class name “Circle”. static method main(), which is the entry point to the program. This method implements the demonstration of the abstract class Figure. name = GetName(f1); // name = "Triangle"
name = GetName(f2); // name = "Circle"
Explanation of an example (see previous paragraph) in the form of questions. The class Figure is a generalization of a geometric figure. This class defines the general properties of the whole variety of geometric shapes. Specific shapes (triangle, circle) extend (extends) the capabilities of the class Figure or, in other words, inherit the class Figure. In our case, the triangle (class Triangle) and the circle (class Circle) are chosen as concrete figures. In the Figure class, the Area() method is declared as abstract, since it is impossible to determine the area of a generalized figure, since it is not yet known what figure it is (triangle or circle). For a triangle (class Triangle) the area is determined by the Heron’s formula. For a circle, the area is determined by the standard formula S = π·R2. From here we can conclude: it makes no sense to call the Area() method from the base class Figure. This method is declared only for organizing a hierarchical call to the Area() methods, which calculate the areas of shapes of specific implementations of the classes derived from the Figure class. In our case, these derived classes are the Triangle and Circle classes. If a class contains at least one abstract method, then this class is considered as abstract. The Figure class contains two abstract methods, so the abstract keyword is placed before the class declaration. If the method is declared abstract in the abstract class (with the abstract keyword), then this method should not contain implementations (according to Java syntax). This is explained by the fact that calling this method does not make sense. Yes, it is. An abstract class may contain non-abstract methods (as opposed to an interface). is a Java compiler error: “Cannot instantiate the type Figure”. The GetArea() method gets a link with the name f of the abstract class Figure, which is the base class hierarchy (two classes, Triangle and Circle, are inherited from the Figure class). Then the Area() method in the string is called by reference. At the time of compiling of the GetArea() method, it is impossible to say which instance of a class (Triangle or Circle) will be passed to the method. So you can’t say which Area() method will be called. Therefore, a reference to the base class Figure is passed to the method. area = GetArea(f1); // the instance of the Triangle class is passed. various references (f1, f2) are passed to this method which are instances of classes derived from the class Figure. These references are instances of the Triangle and Circle classes. inside the GetArea() method, the compiler assigns to the reference f the value of the link f1, which points to the class that contains the Area() method of the Triangle class. Thus, the binding of the generalized reference f to the class Triangle occurs due to the inheritance hierarchy. This binding is called late binding. Details of late binding – this is another topic. Yes, it is. The abstract class allows the implementation of non-abstract methods. If a class derived from an abstract is declared, and in this class there is no implementation of abstract methods, then this class is automatically considered as abstract. You must specify abstract before the name of this class, otherwise the compiler will generate an error. Example. Below is an example of a hierarchy of abstract classes. As you can see from the example, in class B, the abstract Show() method is inherited, which has no implementation. Therefore, you must specify the abstract keyword before declaration a class B. Yes, it can. This is necessary in cases where abstract methods in the class are not needed, but the creation of instances of this class must be prohibited. in interfaces, all declared variables are implicitly considered as constants (declared with the keywords final, static). In abstract classes, declared variables are not considered as constants. abstract classes are useful when reworking programs. With the help of abstract classes, you can easily “move” general methods up the hierarchy.